Historically, we’ve separated the efficacy of medical products from the appeal, usability, and excitement of consumer products. But a brand new class of medicine is emerging that combines consumer trends with robust scientific validation, breaking many long-unspoken rules about how medicine should look and feel. Join Dr. Eddie Martucci ’04, scientist, startup founder and CEO of Akili Interactive Labs — a leading “digital medicine” company — as he describes his newest ventures in innovative medical technology, and discusses how medicine evolves when we rigorously study what we hadn’t before. 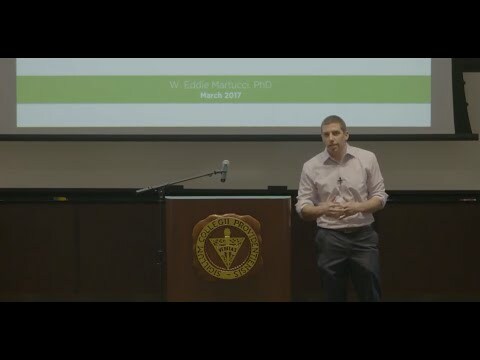 W. Eddie Martucci, Ph.D. ’04 earned a bachelor of science degree in biochemistry while also completing the rigorous Liberal Arts Honors Program at Providence College. He earned his M.Phil. and Ph.D. degrees in molecular biophysics and biochemistry from Yale University in 2009. Conducting research jointly the Departments of Pharmacology and Molecular Biophysics and Biochemistry with a focus on structure-based design, he led a research project that identified two novel chemical scaffolds as proof-of-concept compounds for novel therapy. After earning his doctorate, he studied healthcare entrepreneurship as a Kauffman Fellow through support from the Kauffman Foundation, a nationally-recognized leadership program for venture capitalists and innovators. For the last eight years, Dr. Martucci has worked at Boston-based PureTech Health, a healthcare bio-tech company, where he helped launch their digital health initiative and co-founded two health-focused start-ups. In 2012, he co-founded and currently serves as CEO for Akili Interactive Labs, a company recognized as pioneering the new field of “digital medicine.” Eddie frequently serves on discussion panels for industry and academic events related to healthcare innovation, has appeared in media including CNN’s Vital Signs with Sanjay Gupta, and his company has received recognition including the 2014 Future of Health Technology product award, 2015 50-on-Fire Boston, and the #1 health company in Entrepreneur magazine’s 100 Brilliant Companies of 2016. Teresa Lavoie, J.D., Ph.D. ’89 established the endowed Anna E. Lavoie Memorial Lectureship in tribute to her late mother. Its purpose is to encourage PC students to consider a wide array of career paths in the sciences through interaction with distinguished scientists and other professionals. After graduating from PC’s rigorous Liberal Arts Honors Program with a B.S. in chemistry, Dr. Lavoie went on to earn Master’s and Ph.D. degrees from Princeton University, followed by a J.D. from the University of Minnesota Law School, where she is now an adjunct professor. Teresa is principal at Fish & Richardson, where she represents a range of clients with a focus on start-ups in the biotech and biopharma industries.